Mac-Lander, Inc. warrants each new vehicle and/or body it manufacturers to be free from defects in material and workmanship, when used within prescribed weight limitations, for a period of three years from date of purchase to original purchaser. The 90-day warranty on painted surfaces is an exception to this policy. Any part or parts of a Mac-Lander commercial vehicle and/or body subject to this warranty which our examination discloses to our satisfaction to have been defective in material and workmanship, when returned to use with transportation charges prepaid, will be replaced or repaired without charge. Any alterations to a Mac-Lander unit or the installation of any equipment, material, parts not made or supplied by Mac-Lander, Inc., without approval of Mac-Lander, Inc., shall void this warranty. The responsibility of Mac-Lander, Inc. is limited to conditions here expressed notwithstanding any representations or warranties made by any other persons. This warranty does not apply to any purchased components such as — but not limited to — tires, tubes, suspensions, axle assemblies, or any non-standard features or items specified by the purchaser. Furthermore,this warranty does not expand, enlarge upon, or alter in any way, the warranties provided by the manufacturers of such components. This warranty covers only repair or replacement of defects and malfunctions to Mac-Lander, Inc. equipment, material or parts outlined herein. It does not assume any responsibility, under any circumstances, for any additional expense or damage which occurs AS A RESULT of a defect or malfunction. This express warranty is the only warranty applicable to Mac-Lander commercial vehicles and/or bodies and is expressly in lieu of any warranties otherwise implied by law — including but not limited to implied warranties of mechanical nature or fitness for any particular purpose. The remedies available under this express warranty shall be the only remedies available to the purchaser/user with respect to defects in materials or workmanship. 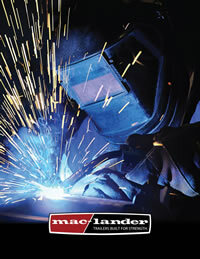 Mac-Lander, Inc. reserves the right to make changes in design and changes or improvements upon its products without incurring any obligation to make said changes or improvements upon products previously manufactured. The few extra minutes it takes to fill out the warranty papers you find in your owners manual will be well spent. Once you return these papers, they are kept on file at Mac-Lander, Inc. And as a valued customer, you’ll receive important safety and informational bulletins on the use of your trailer. Most importantly, the submission of your registration information will activate your warranty. You’ll rest easy knowing that, in the event something does happen to your trailer, you’ll be covered!